How Are Common Language Technologies Used? With all of the recent technological advances in machine (or computer) translation, it’s easy to wonder if your Language Service Provider (LSP) is just plugging your copy into some software before they send it back. At Avantpage, the short answer is no—we definitely don’t do that. 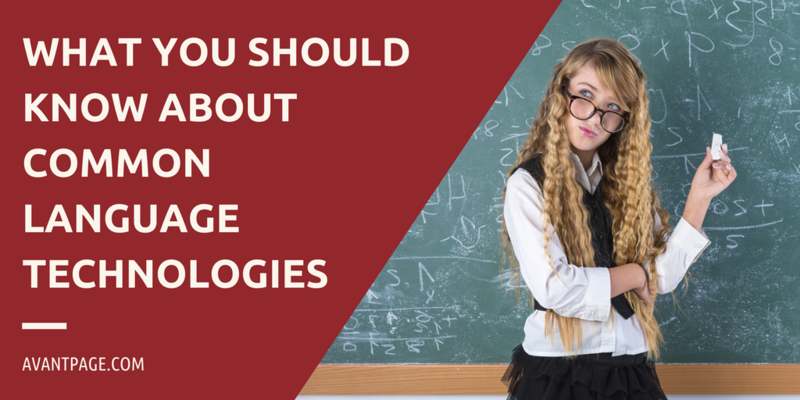 Here’s a brief overview of common language technologies and how they’re used. Rule-based translation uses existing grammar rules and dictionary entries. Unfortunately, despite mimicking the human brain, this method usually produces poor results. Statistical translation uses data from a large amount of existing bilingual material, known as a corpus, to translate commonly used words and phrases. Examples of multilingual data include the records of the European Parliament, which is produced in 23 languages. Google Translate has used this type of software since 2007. It is more often correct than rule-based translation. Hybrid machine translation uses the best features of both statistical and rule-based translation. SYSTRAN, which powers Babel Fish, claimed it introduced the first hybrid translation engine in 2009. Neural Machine Translation (NMT) is an approach to machine translation that uses a large neural network, which is a computing system inspired by the biological neural networks of animal brains. Neural networks learn to do tasks by considering examples, generally without task-specific programming. Google and Microsoft translation services now use NMT. What Shortcomings Does Machine Translation Have and How Can They Be Overcome? The problem with pure machine translation is that when a user inputs one document and gets a translation back, the result is extremely rough. An audience will spot errors instantly. That’s where a human translation service can take over. Common language technologies used for machine translation are best used as part of a quality-focused process in which people control and monitor the output of the machine translation all the way to the final translation product. How Can Technology Make The Translation Process More Efficient? At Avantpage, we use glossaries and translation memory to save our clients time and money while maintaining consistency within a translated document and among other translated documents. Custom glossaries are built for each client to record their preferences for future use. For example, if a client prefers the word “team member” instead of “employee,” that’s the word that will always be used. By using glossaries, any of our translators will be able to pick up material related to the same client and have fewer questions about the way certain terms should be translated. Translation Memory software helps us build on the previous work of our translators to save time. Once a document has been completed and reviewed for quality assurance, it is converted to a TM file. When it’s time to complete a new translation for the same client, we can analyze the new document against previously translated documents. The application helps decipher which words and phrases have been repeated and indicates how they were previously translated. This allows us to maintain consistency and translate similar phrases the same way, controlling your voicing and brand consistency. For clients that direct their communications to many users one document at a time, this method helps you treat all your recipients fairly and equally. Even with all the technologies available, we believe the best translations pair those tools with an educated human translator, which is how we build every project’s translation process.